They've got a new captain of the guards coming to San Quentin in Pat O'Brien. Barton MacLane who held the job previously is demoted and is in a foul mood. A couple of new prisoners are arriving as well. 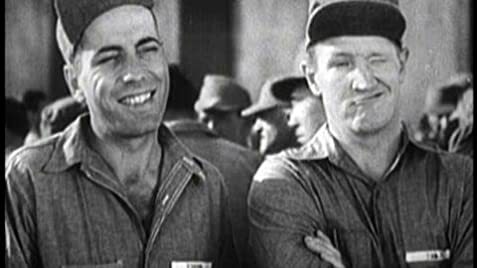 Joe Sawyer as a hardened criminal and Humphrey Bogart who O'Brien believes is salvageable. O'Brien also meets up with Bogey's sister, Ann Sheridan and they get to kanoodling. Each for their own motives, Sawyer and MacLane play Iago to Bogey's inner Othello and Bogey and Sawyer crash out of San Quentin. Back in the day Warner Brothers was the great working class studio, with many a film of social significance. San Quentin is one of these, but it's hardly the best one. I'm at a loss to see why O'Brien thinks Bogart is so salvageable other than his involvement with his sister. Joe Sawyer has one of his best film parts in San Quentin. He's a hardened criminal and that's all there is to it. He played a similar role vis a vis Bogart in Black Legion which is a much better film. Also Garry Owen has a nice turn as a stir crazy convict who O'Brien has to face down and disarm. Dedicated fans of Humphrey Bogart will like this film, others can take it or leave it. American Film Institute Catalog of Feature Films 1931-1940 identifies Emmett Vogan as a Lieutenant and Gordon Oliver as a Captain. It's very apparent from their quite visible insignia in the scene in which they are both featured that the older Vogan is the Captain, and the younger Oliver is the Lieutenant. Shadow of the boom microphone can be seen moving up the row of men to the left during their lineup at the beginning of the film.